Wonder awaits when you wear this lavish 19th century gown out on the town. The Blue Hellfire Gown is made of a blue floral rayon with a black Antebellum waist and velveteen belt. This Edwardian dress displays an asymmetrical hem. The Dita Corset Dress is a fine showing of exotic style, possessed of several features that make this an appealing dress for any woman to wear, thanks to its style and a level of detailing that makes this garment look fit for the stage. Inspired by Victorian fashions, this off-the-shoulder gothic dress offers an elegant option for fancy evening engagements. The Dita Cream and Black Taffeta Corset Dress includes a built in corset to create its stunning silhouette. Inspired by Victorian fashions, this off-the-shoulder vintage dress offers an elegant option for fancy evening engagements. The Dita Cream Taffeta Corset Dress includes a built in corset to create its stunning silhouette. 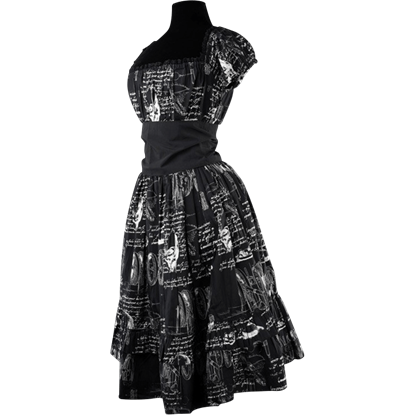 This stylish black Steampunk gown has a pleated skirt layered with a floral veil. A faux sealskin corset with faux leather front straps and armbands complete the look. Our steampunk gown comes with mini top hat and veil. When it comes to class, the Victorian age had it all. The influence of that era is strong even today. For a sampling of its beauty and appeal, you need only glance towards a woman wearing this Ladys Lace Trimmed Steampunk Dress! Fans of gothabilly subculture are sure to enjoy the vintage schematic drawings that cover the Leonardo Inventions Gothabilly Dress. This comfortable steampunk dress can be worn for almost any occasion, especially on summer days. 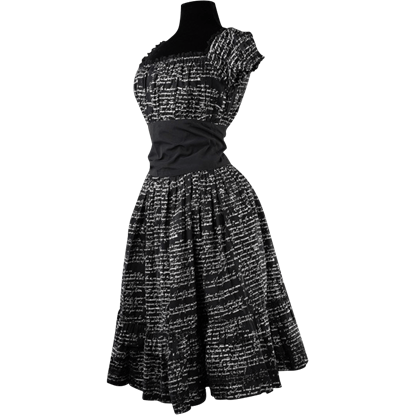 Fans of gothabilly subculture are sure to enjoy the vintage script print that cover the Leonardo Writing Gothabilly Dress. This comfortable steampunk dress can be worn for almost any occasion, especially on summer days. 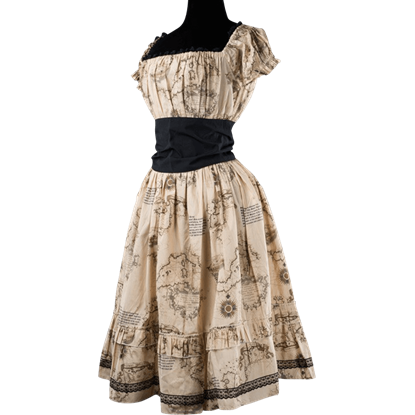 Fans of gothabilly subculture are sure to enjoy the charming steampunk twist in the design of the Map Print Gothabilly Dress. This comfortable vintage dress can be worn for almost any occasion, especially on summer days. Fans of the 1927 science fiction classic film, Metropolis, will enjoy this fun dress inspired by the work. The Metropolis Dress features a deconstructed appearance that gives it a great sci-fi aesthetic. Not all steampunk style is eccentric gadgets and technological marvels. Sometimes, it is infused with a spark of revival and ingenuity. 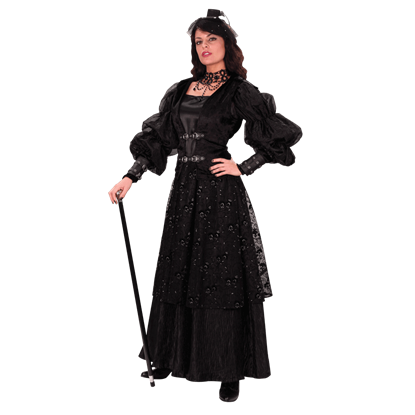 Such is the case with this Neo-Victorian Ladys Fancy Dress, which merges the old and new. 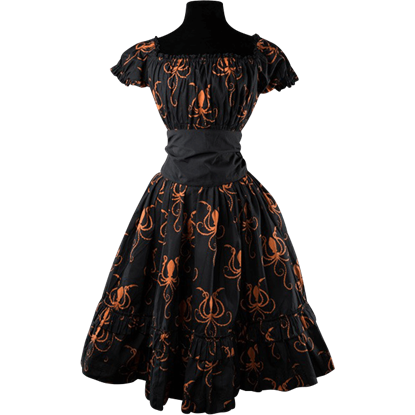 Fans of gothabilly subculture are sure to enjoy the nautical twist in the design of the Octopus Print Gothabilly Dress. 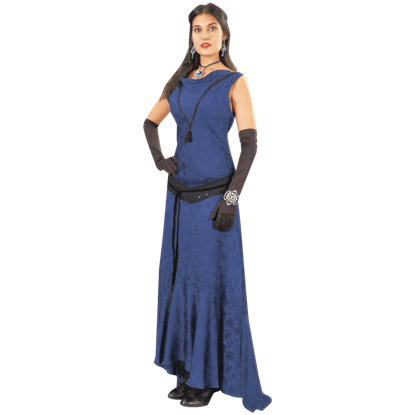 This comfortable steampunk dress can be worn for almost any occasion, especially on summer days.